Cultural norms usually dictate which behaviors are socially acceptable. Thus, some societies may view a behavior as a mental illness or disorder while others do not. Similarly, some online sources suggest that a mental illness is different from a mental disorder. This article seeks to find out if there is a difference between the two. A mental illness, also called a psychiatric disorder, is an illness of the mind that may cause a person to exhibit strange behavior. Such abnormal behavior sometimes includes having strange thoughts (e.g. suicide, paranoia), or whispering or talking to one’s self. Moreover, a mentally ill individual can only be diagnosed as such if a deviation from normal social behavior can be directly observed. While current clinical documents usually use the term “mental illness,” it is common to see the term mental disorder used interchangeably as well. The onset of mental illnesses (i.e. mental disorder) occurs during the life of an individual. There are mental illnesses in the past that are no longer considered as deviant behavior today. Moreover, some cases of mental illnesses are not considered as such in different cultures. A standard tool called the Diagnostic and Statistical Manual of Mental Disorders which was developed by the American Psychiatric Association is recognized and used worldwide to identify various cases of mental illnesses. Studies on mental health in the US reveal that the major types of mental illnesses make up the most common type of disability in the country. These mental illnesses include depression, personality disorders, bipolar disorders, obsessive-compulsive disorder, body dysmorphic disorder, and schizophrenia. According to the National Alliance of Mental Illness, about thirty-three percent of adults in North America will develop a mental disorder in a given year. Fortunately, half of these cases are not severe enough to cause problems in the day-to-day functions of these individuals. Although the causes of mental disorders are not yet clearly defined, landmark studies have also found out that mental illnesses can be partly attributed to heredity. Research findings published in medical journals suggest that a specific set of genetic markers are found in individuals with autism, schizophrenia, major depression, attention deficit hyperactivity disorder, and bipolar disorder. 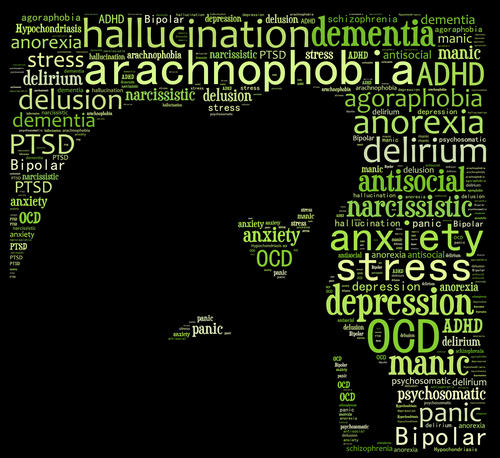 Mental disorders can be treated with psychotherapy, medication, and electroconvulsive therapy. Mental illnesses are characterized by many categories and can affect different aspects of a person’s behavior and personality. Anxiety disorders such as specific types of phobias, panic disorder, post-traumatic stress disorder, and general anxiety disorder can interfere with a person’s normal daily functions. Psychotic disorders, which includes schizophrenia and delusional disorder can distort one’s perception of reality and belief patterns. Narcissism, antisocial behavior, anxious-avoidant, and obsessive-compulsive disorders are considered personality disorders. This type of disorder is usually developed during childhood, adolescence, and early adulthood. Other categories of mental illnesses include eating disorders (anorexia nervorsa, bulimia), sexual disorders, impulse control disorders (kleptomania, pyromania), and addiction to gambling, alcohol, and substance abuse. So what’s the difference between a mental illness and a mental disorder? There is none – mental illness and mental disorder are both used interchangeably to refer to varying states of mental conditions such as depression, personality disorders, bipolar disorders, and obsessive-compulsive disorders just to name a few.